Reflex have installed Gerflor Taraflex Sport M performance flooring to a beautiful new facility in Canterbury. The sports hall is to be used for many sports but was designed as a specialist fencing facility. Reflex have installed flooring to a design where the fencing pistes are a different colour and the effect is amazing. 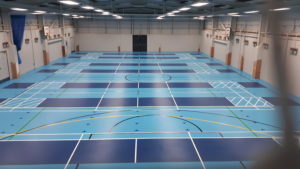 Reflex are an independent sports flooring specialist and will work with the Architect/Designer to install the best flooring solution for the project. Please contact us with your project and we would be delighted to help.